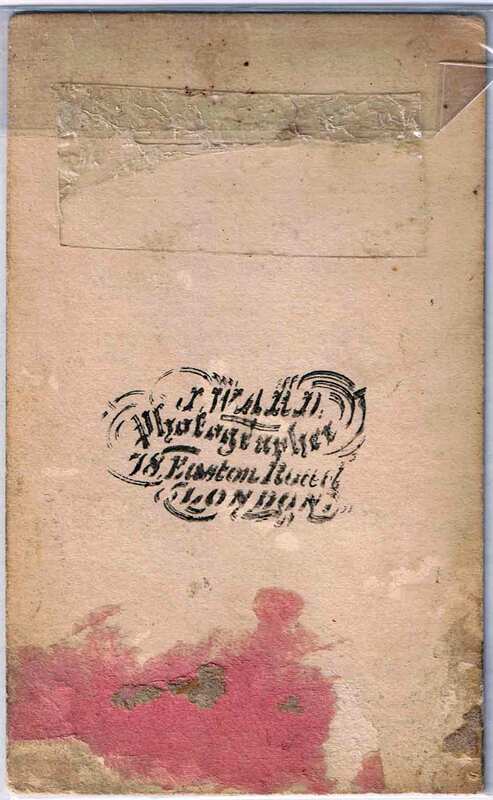 Note: I only assume this is a frenchwoman because I bought the CDV in Paris. Nothing about her dress looks particularly French to me. This woman wears a one-piece dress composed of a bodice and skirt, made of what is probably a heavy silk or silk/wool mix. The bodice is darted to fit, with a pleat from shoulder to bustline. Whether this pleat was incorporated into the shoulder seam or happened naturally is unclear, but this particular shoulder-to-bust pleat was popular from the 1840s through the 60s. It gave an attractive, crisp line from shoulder to bust, and emphasized the hourglass shape. The skirt is full and worn over a cage crinoline. 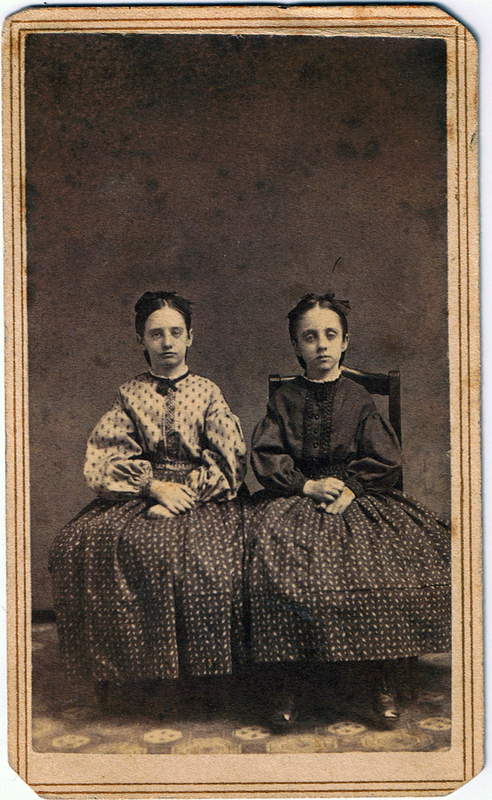 Her dress is trimmed on the bodice and sleeves with bars, probably made of a flat tape. A white collar, undersleeves, and brooch at the neck complete the look. She wears her hair center parted and rolled in soft puffs towards her face. Her hair is coiled relatively high, i.e. 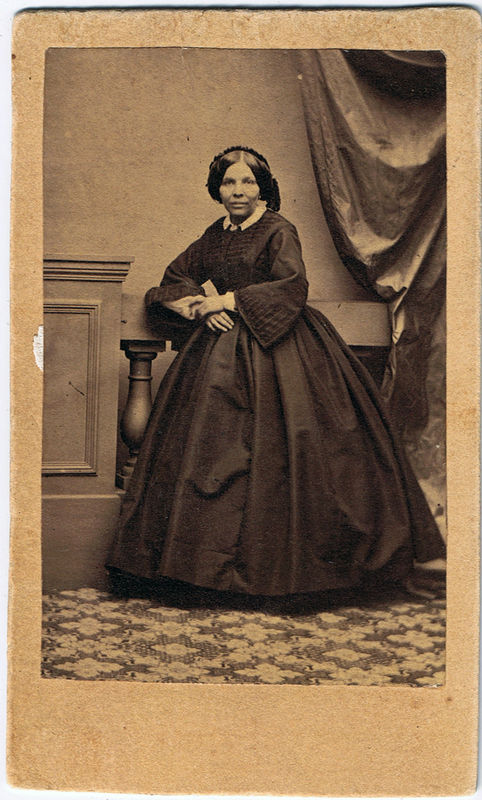 no lower than her hairline, which indicates either an early photograph date (closer to 1859 than the mid 60s), or that she is an older woman slightly behind the current fashions. She completes the look with a decorated hairnet with a tassel (or feather or clump of ribbons, the photograph is unclear). This woman wears a hip-length, unfitted paletot over her dress. The jacket is either a shiny, worsted wool, or a wool/silk mix. The jacket is trimmed with two rows of dark ribbon- probably black velvet- and a row of decorative buttons down the front. Curiously, two of the buttons read as white and the rest as black. It is unclear if the white collar is attached to a dress-bodice underneath, or if it is attached to the jacket which is functioning as a bodice. A brooch fastens at center front and neck. The dress, of which only the skirt is visible, is striped. Her hair is parted in the center, and she wears an elaborate headdress or cap. These caps were in style in the 1850s, and so it is not surprising that an older woman would wear something a litlle out of style. Unlike headdresses of the early 1806s, which formed a moderate amount of fullness from forehead level to the nape, this 1850s style concentrates all the fullness at ear-level. Wide ribbons falling on the shoulders complete the full-yet-droopy look. Younger woman: The younger woman wears a plain dress over a wide cage crinoline. No trim details are visible on her dress, except for the dark ribbon belt/sash tied fashionably at the side front of her waist. The black cord hanging from her neck is probably a watch fob. A slim white collar fastened with a brooch completes the dress. Her long, fair-weather coat (i.e. more decorative than functional), probably made of wool, is trimmed with two rows of ribbon around the neck and down center front. 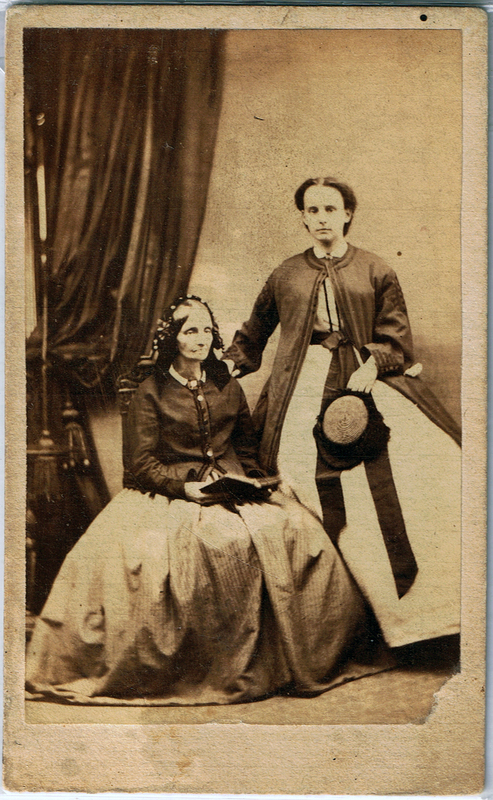 Her sleeves are also trimmed in ribbon or tape, in a vaguely military style that was faddish in the early to mid 1860s. The white handkerchief at her elbow indicates the presence of a coat pocket. She fastens only the first button; the rest of the tiny buttons which go only to rib-cage level lie unused. This button formation is unusual for the period; most coats have large buttons that extend past the waist. 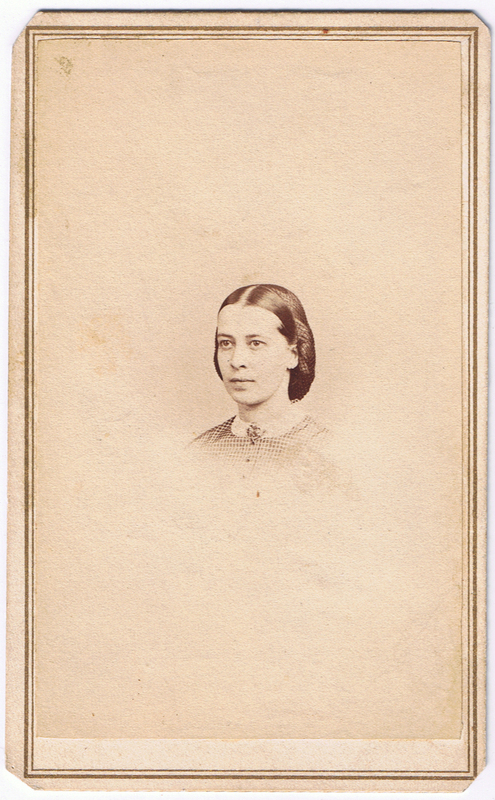 Her hair is center parted and rolled away from her face and bound in back in a low coil. She carries her hat, which appears to be straw and trimmed with ribbon and possibly flowers. 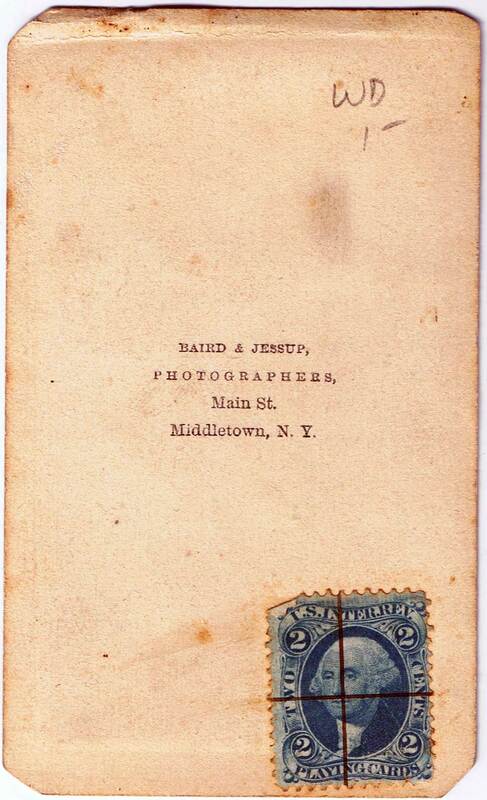 Backmark: F.S. 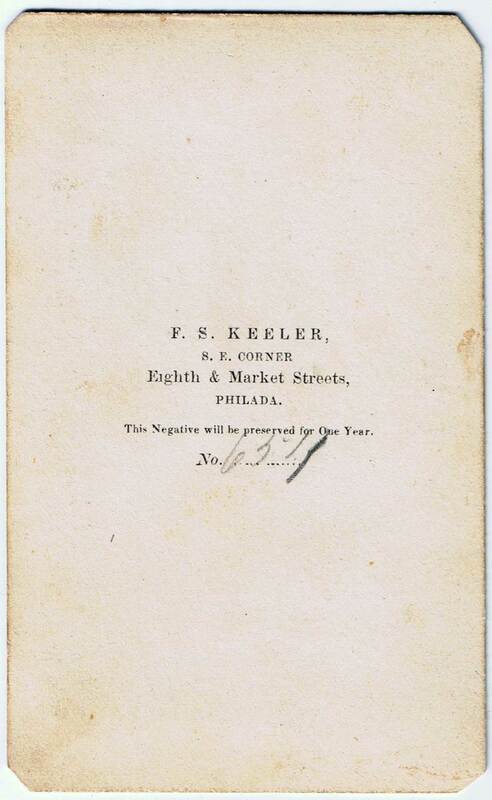 Keeler, S.E. Corner Eighth & Market Streets, Philada. This Negative will be preserved for One Year. No. 637? This woman’s dark, straight hair is parted in the center and confined in back in a low-lying bun or twist. Her hair is covered by a hairnet covered with tiny beads at every join. It is clear from the mass of hair at the sides that she is using fake hair. The width begins about an inch above and directly on top of her ears. The hair appear to be rolled back (away from the face) into a very thick braid or series of rolls. Note how far down her neck her hair rolls lie. Her dress appears to be a barred (what we now call ‘widowpane’) silk. She wears a white collar basted in, about 1″ wide at the fronts with rounded edges. There is a brooch pinned where the collar meets at CF. There are decorative buttons down the front placket opening. – What is the lacey type white thing showing at the bottom of her hair? Is it her collar sticking up, or something else?